Yesterday I babbled about lip balm and keeping your lips smooth and hydrated. What if they're not smooth yet? Get scrubbing! Tarte Maracuja Lip Exfoliant ($16 for 0.7 oz) - Sugar's the first ingredient, followed by two oils and two waxes. It's sugar in a pretty standard balm. The ingredient it's named for, Passiflora incarnata (passion flower) seed oil, is barely even in it. It's lower on the list than the preservatives. Bite Beauty Whipped Cherry Lip Scrub ($18 for 0.26 oz) - The description mentions rice bran, but I don't see it on the list. The scrubber in this one is wax microbeads. The benefit of that over sugar, nut hull powder, or other physical exfoliants is that the wax will melt if you scrub too vigorously. It doesn't need to be wiped off either, since they'll melt with body heat eventually. Beyond that, we're looking at an olive and pistachio oil balm base. Bliss Fabulips Sugar Lip Scrub ($18 for 0.5 oz) - Another lip balm base, but with sugar and nut hull powder. If you've ever used St. Ives Apricot Scrub, you know you can easily overscrub with nut hulls. The other twist with this one is a gizmo for applying it. I can see the appeal of a pre-mixed product, but I'm stingy, in my own way. I have sugar. I have lip balm. This is the easiest DIY ever, and one of the cheapest and most effective. It's also a great way to use up the last little bits of balm left in the tube. You're gonna want to do this over the sink. It's a bit messy. Start by putting way too much balm on your lips, more than you'd ever normally apply. 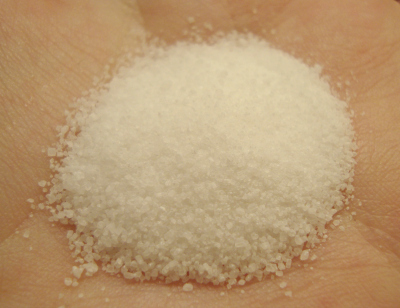 Pour some sugar into the palm of your hand. 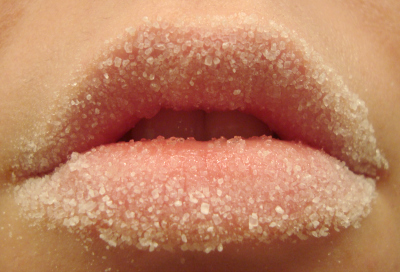 This is where you'll feel silly, but press your greezy lips into the sugar until coated. Scrub gently with the pad of your ring finger, in a circular motion. Continue until they tingle a little, but not long enough that it's uncomfortable. The sugar will melt in slightly, but not completely. Gently wipe off the rest with a damp cloth. My lips weren't that bad before, but I think you can still see a difference. The little flaky bits are gone. Slick back up with balm afterward and admire the schmoooove. They'll feel awesome and you'll look like a dork rubbing them together all day...or is that just me? This isn't something you should do daily. It's more of an "as needed" thing. I really wish I'd done it weeks ago! What I do more regularly, especially if I'll be wearing a dark lip color, is give my lips a very quick, gentle brushing with my toothbrush after I've rinsed it off. I don't recommend doing this if you use a firmer brush. Exfoliating goes beyond just the look and feel. Lip color will go on more evenly and wear better. There's also nothing to pick at. 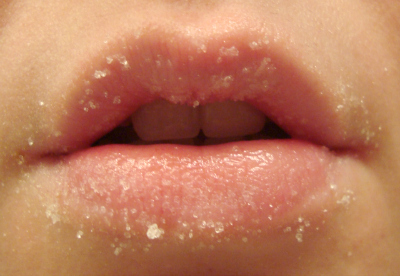 Picking at peeling skin anywhere is bad, but it can be even worse on lips. You can wind up with an ugly, painful sore. Ick. Now that I'm all smoothed out, I'm ready for some color! You can get some sneak peeks on Instagram. This has been My craziest winter so far (with snow and all!) & my hair & lips are paying. I'll do this on my lips ASAP.